If you’ve ever come across a news article and wondered if there’s more to the story, you’ll find Transparent quite handy. 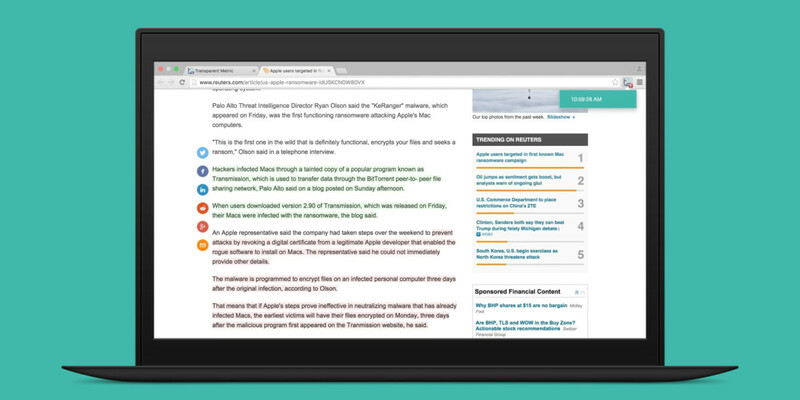 This Chrome extension reveals the changes made to articles on several prominent news sites, highlighted and color coded on the same page so you can tell at a glance what was added and omitted from the latest version. Whether an article has been censored or if details have been added after the fact, you’ll be able to spot the edits in a snap. The extension’s toolbar button reveals when changes were made. Clicking on each timestamp in the drop-down menu shows additions on the page highlighted in green and deleted text in red. Transparent’s developer Daniel Karpinski says the extension was inspired by NewsDiffs, which maintains an archive of changes in posts from outlets like The New York Times,CNN, Politico, and the BBC. But unlike such repositories which typically follow stories over a couple of days, this tool scans articles constantly and for as long as they are available online. The extension currently works on the BBC, Aljazeera, the Guardian, The New York Times, Die Zeit and Reuters. It’s certainly useful if you’re tracking a story over a long period of time. Plus, it saves you the hassle of scanning archives to find if an article has been changed. Karpinski tells TNW that he plans to add support for more sites in the future. He added that the current functionality of Transparent will remain free, but he hopes to monetize data collected by the extension by packaging it for businesses.